DO YOU ACCOMMODATE RUSH ORDERS? When we can, we absolutely will. Please contact us to determine whether or not your needs can be accommodated in time. J Grace is happy to accommodate intimate gatherings or grand affairs. 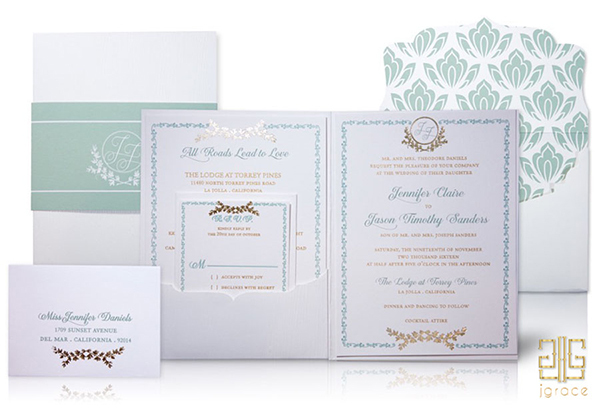 Our minimum order for Collection pieces is 50 invitations or accessories. DO YOU WORK WITH CLIENTS OUTSIDE OF CALIFORNIA? Absolutely! Thanks to modern technology, J Grace is able to work with clients world wide. Because often additional guests are thought of after you have made your general list we recommend ordering approximately 10% more invitations than your guest list. A production timetable will be presented in your contract. Typically, the complete process will take between 10 -12 weeks allowing for proofing and production combined. We understand that sometimes plans change and invitations are no longer needed,Once the contract is signed, your initial deposit cannot be refunded. However, if your project has not gone into production yet, no additional charges will be required.